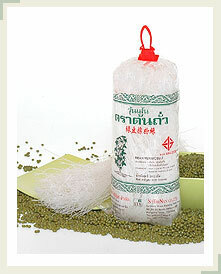 “Bean” brand vermicelli is essentially produced from Mung bean as principal raw material. And another type of starch is used as a supplement to ensure that the “Bean” brand vermicelli is of suitable springiness in quality and gives milder flavor when used in preparation of food that does not require long heating process. And to ensure that the vermicelli threads absorb ingredients in salad or fried dishes without become swelled or reduced to soft texture. At present, the Bean brand vermicelli is available in one description, which is the original one, that is, the threads are long, in rolled pack and come in 4 different sizes, i.e., 500 gm, 200 gm, 80 gm and 40 gm.